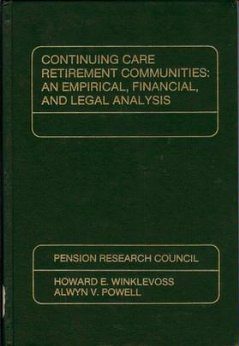 Published in 1984, this was the first systematic analysis of Continuing Care Retirement Communities (CCRCs) in the United States. These offered insurance against the costs of long-term care and supplemented coverage of acute healthcare costs paid for largely by Medicare and private insurance. The CCRCs’ unique feature was that they provided this insurance in combination with independent living arrangements that the resident could enjoy as long as health permitted. The study was the first detailed analysis of the actuarial, financial, and legal issues central to protecting CCRCs’ financial soundness and providing for the formation of new communities securing residents’ rights while assuring the perpetuation of the community.